Because stains or colours only hide its natural beauty, our Walnut floors are only available with a clear (natural) finish. We are pleased to be able to offer bespoke wood floors in FSC-certified Walnut, guaranteed for 25 years. The particular species we use is the American Black Walnut (Julans Nigra), which grows across Southern Ontario, parts of South Dakota, Georgia and Texas, and Northern Florida. 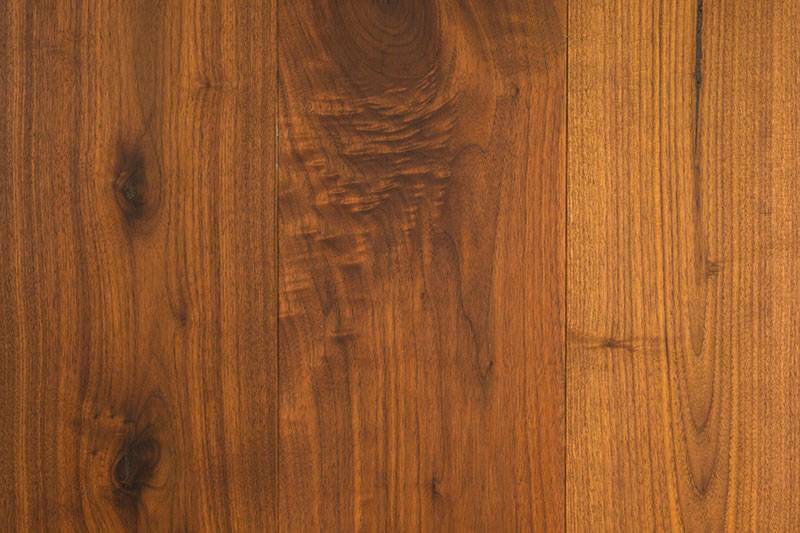 The wood has a distinctive and fairly straight grain and a beautiful dark colour. Does Walnut Work Well as a Choice of Flooring? 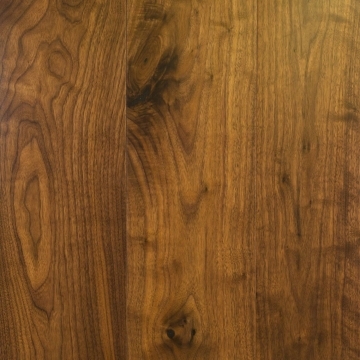 Walnut is one of the hardest woods in the world, but because it has a more ‘open grain’ than Oak (by that we mean that its cell structure is different) it is actually more likely to take a dent or scratch than an Oak plank subjected to the same impact or scraping. That said, a properly oiled Walnut plank will hide scratches and dents very well. Walnut is harder than Oak but it is less stable and will crack under temperature fluctuations that change the moisture content of its environment. For this reason we will not supply solid planks in Walnut, and we will only install Walnut solid parquet flooring where there is no underfloor heating – although we do offer engineered Walnut parquet planks that are suitable for use with underfloor heating. What are the Finishing Options for Walnut? While we offer both prime and natural grade, brushed or smooth finish, and can also distress our Walnut floors, we currently only offer a clear colour finish. This is because in our experience any customer who wants this species wants it for the wood’s distinctive dark chocolate colour. Indeed, there is little point using Walnut unless you want this particular look; a stain or coloured hard wax oil will only take away from its natural beauty. If you’ve decided on a Walnut floor, then your next decision will be whether to go for a lacquered or oiled finish. If you choose lacquer then it is applied to the wood by our manufacturer using a spray gun; if you choose oil then we will apply this finish by hand ourselves. If you want a distressed finish then you must go for an oiled floor as we distress all planks or parquet blocks by hand (in fact our founder Mursel will not let anyone else do this). Which is the better choice? We recommend an oiled floor: they are easier to keep looking their best. Lacquer does offer better protection against most spills, but it doesn’t take damage as well as an oiled floor. Scratches can be harder to disguise (although we can remove most imperfections under our standard ‘after-care’ plan, which is free for three years). Dents are usually impossible to remove without sanding the floor and re-applying the lacquer. We actually recommend that a lacquered floor is sanded and a fresh coat of lacquer applied every three years. An oiled floor on the other hand can be re-oiled once a year to keep it looking its best. Where does Woodcraft’s Walnut come from? Although the Walnut we use comes from FSC-certified forests in North Amercia, our supplier is actually based in the UK. 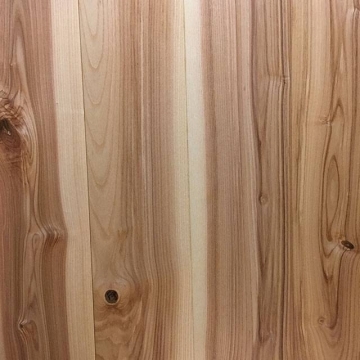 They approached us with samples and we were impressed by both the quality of the wood and the finished product. Their engineered planks are manufactured using a ‘cold press’ technique almost identical to that our Oak supplier utilises, with eight layers of Birch in the plywood base to create an engineered plank that has real strength and stability. You can read more about the ‘cold press’ technique here. What Size Planks are Possible? 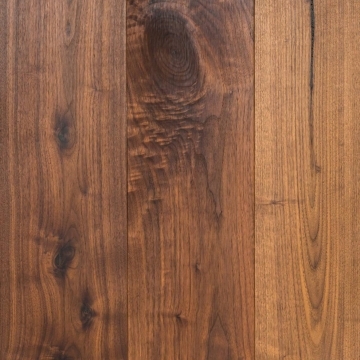 Our engineered planks are 20mm thick, of which 6mm is the top layer of Walnut. Widths of 120, 140, 160, 180 & 190mm are available, with lengths from 1.2 to 2.6 metres. It is slightly more expensive than Oak. The lead time for a Walnut floor is usually two weeks for a lacquered floor and three weeks for an oiled floor.